A little more than a week after Murray State was eliminated from the 1998 NCAA tournament head coach Mark Gottfried left to take the head coaching job at the University of Alabama. It took just two days to find his replacement as MSU selected Gottfried's top assistant, Tevester Anderson, to be the 12th head coach in the history of the program. Anderson was introduced in a press conference held in the brand new Regional Special Events Center, the first event to take place in the facility. With Isaac Spencer, Rod Murray, and Duane Virgil back Anderson was confident his front line could match up with anybody. The backcourt was another matter entirely. When Chad Townsend and De'Teri Mayes graduated the previous spring the Racers lost one of the best guard tandems in school history. Anderson knew he would have to rely on Aubrey Reese and Marlon Towns. Reese had played sparingly as a sophomore, averaging just 4.6 points. He did shoot well from the floor, 48.9 percent overall and 37.5 percent from three-point range. And he had proven himself to be a solid ball handler. Towns had played his freshman season at Arkansas and like Reese he had seen limited action. He was a highly regarded high school player though, having been chosen as the top player in the state of Tennessee when he was a senior and one of the top 30 players in the nation. 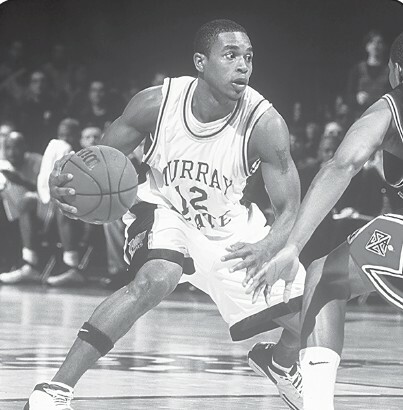 He came to Murray State from Northern Oklahoma College where he averaged 18 points and 15 rebounds and was tabbed by CNN/SI as one the top mid-major newcomers in the nation. In the opener against Southern Illinois Reese and Towns struggled. Reese scored nine points but was 2-for-7 from the field and 5-for-10 from the foul line. And Towns scored just one point as he missed all seven of his shots from the floor and made just 1-of-3 free throws. Spencer led the Racers with 16 points. Virgil had 15 and Murray had 11. With just under five minutes to play SIU led 62-57 and Towns was out of the game, having been taken off the floor on a stretcher after a blow to the head. But Murray State scored the final eight points of the game to win it 65-63. It was clear though, that Reese and Towns would have to play better for the Racers to reach their ultimate goal, an OVC championship. After a victory at Belmont MSU crushed Arkansas-Little Rock 91-66 in the first round of the Sooner Classic as Towns hit 5-of-10 three-point attempts and Reese dished out 10 assists while committing just two turnovers. But the Racers' guard play was shaky again in a 68-64 victory over Oklahoma in the championship game as their starting backcourt committed 11 turnovers and hit just 6-of-20 shots. Fortunately, they made up for that by outrebounding the Sooners 46-23. Spencer grabbed 14 rebounds, scored 13 points, and was named tournament MVP. Conference play got under way with a trip to Death Valley to play Morehead and Eastern Kentucky on December 3. And the Racers' guards signaled that they were coming of age with a scintillating performance in a 90-59 victory over the Eagles. Reese hit 8-of-14 shots and 3-of-6 three-pointers as he scored 19 points. And Towns hit 3-of-4 three pointers and 6-of-7 free throws for 17 points. Murray and Spencer also had big games as they scored 16 and 15 points respectively. Three more wins pushed the Racers' record to 8-0. And at 2-6 Western Kentucky didn't seem to be much of a threat when they came to town on December 19. Oh, Anderson cautioned that anything can happen in a rivalry game. But his fears proved to be unfounded as Murray State rolled to a 69-57 victory. Murray and Spencer led the way with 17 points each. After dropping two-out-of-three games in the Rainbow Classic in Honolulu the Racers returned home and returned to OVC play against Tennessee Tech. Murray led five players in double figures with 14 points as MSU rolled to a 75-53 victory. The win over Tech started a four game home stand for MSU which Anderson said would be crucial if the Racers wanted to win another OVC championship. Anderson got just what he wanted as Murray State beat Middle Tennessee, Tennessee-Martin, and Morehead to run its record to 14-2 and 6-0 in conference play. Southeast Missouri was also unbeaten in the OVC so when the two teams met in Cape Girardeau on January 14 sole possession of first place was on the line. With five seconds left Murray State trailed 70-69. Having to inbound the ball under SEMO's basket, Anderson put the game in the hands of his point guard, Reese. The junior quickly made his way downcourt and hit an off balance jumper in the lane with one-tenth of a second left to give MSU a 71-70 victory. Spencer led all scorers with 22 points. Towns had 15; Reese had 13; and Virgil had 12. The Racers then beat Eastern Illinois on the road 86-73 and returned home to beat Tennessee State 81-71. They ran their record to 18-2 before a record crowd of 8,352 at the RSEC by drubbing Austin Peay 89-58. Spencer led six players in double figures with 16 points and 10 rebounds. Three more wins pushed Murray State's winning streak to 11 games and its record to 21-2. But the streak ended on February 6 at Tennessee-Martin. UTM's head coach Cal Luther had announced his retirement earlier in the season. Luther had coached the Racers in the 60's and 70's. And Martin played an inspired game in beating MSU 74-73. That loss was followed by a 62-51 defeat at St. Louis. So the Racers returned home to play SEMO, having lost two in a row. MSU led the OVC at 13-1 while the Indians were second at 12-2. But Anderson downplayed the importance of the game. “It won't decide anything,” he said. “If we win we will be two ahead and if they win we will be tied. It will only put the winner in a better position. SEMO led 26-17 in the early going but Murray State ratcheted up the defensive pressure and the Indians were helpless. At halftime the Racers trailed 28-26. At the beginning of the second half they went to a full court press and that keyed a 13-0 run that essentially put the game away as MSU won it 62-52. The Indians only made five shots from the floor in the second half. Reese led all scorers with 16 points. The Racers closed out the regular season by beating Eastern Illinois at home and Tennessee State on the road before dropping their final game at Austin Peay. Wins over Tennessee Tech and Morehead in the OVC tournament set up a third game against Southeast Missouri in the final. And just like the first time the two teams met SEMO led by one, 61-60 with just over five seconds to play. In a scene right out of the movie Hoosiers, Anderson initially called a play for someone other than Reese who had beaten the Indians on a last second shot a month earlier. Reese streaked down the floor and lofted an off-balance runner over SEMO's 6-10 center Bud Eley as time expired. And he hit it again, giving MSU a 62-61 victory. Reese and Virgil led MSU with 16 points apiece. Spencer had 15 points and 14 rebounds. Spencer and Reese were named first team All-OVC and Murray was a second team honoree. Anderson shared the Coach of the Year award with SEMO's Gary Garner. The Racers went on to play Ohio State in the NCAA tournament, dropping a 72-58 decision. They finished the season with a 27-6 record, a regular season OVC Championship and an OVC Tournament Championship.